Director of the Transfusion Medicine Unit, Blood Bank, and Stem Cell Storage Facility since 1980. An expert in the field of blood transfusion immunology, Dr. Blumberg has worked to enhance the quality, safety, and efficiency of transfusion services at Strong Memorial Hospital and across the broader medical community. 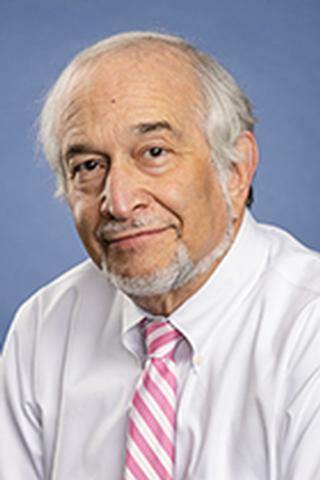 His long-standing clinical and research foci are immune cytopenias, supportive care for patients with hematologic malignancies, and the immunologic sequela of transfusion therapy. Blood transfusions are known to be broadly immunomodulatory and are associated with substantially poorer clinical outcomes in surgical and cancer patients, and better outcomes in solid organ allograft recipients. Our laboratory and clinical group has been interested for the last twenty years in the disparate effects of autologous and allogeneic transfusions on immune function, as well as the potential benefits of removing allogeneic white cells and stored supernatant plasma from blood components before transfusions. Our studies demonstrated that patients receiving leukocyte-reduced allogeneic blood transfusions for leukemia, and those receiving leukocyte-reduced allogeneic or autologous transfusions during surgical procedures, experienced reduced morbidity and mortality compared with patients receiving unmodified allogeneic transfusions. We were the first to document that one likely mechanism for these benefits is that allogeneic transfusions promote type 2 (Th2) cellular immunity and down regulate type 1 (Th1) immunity. Leukoreduction or use of autologous transfusions reduces these immunologic effects. We also have pioneered clinical outcomes and cost-effectiveness analyses in the study of transfusion immunomodulation. Transfusions, however, can also promote inflammatory processes. Platelet transfusions are associated with a dose dependent increase in multi-organ failure syndrome in surgical patients. Work done in collaboration with Dr. Rick Phipps's laboratory has shown that stored platelet transfusion supernatant promotes cellular secretion of PGE2 , IL6 and IL8 in vitro through a soluble CD40L dependent mechanism. Current investigations include clinical and laboratory studies of the effects of stored platelet supernatant CD40L on clinical outcomes and in vitro immunologic function. We are also exploring the possible use of autologous stored platelet supernatant for immunotherapeutic use. "A Randomized Trial of Neonatal Platelet Transfusion Thresholds." The New England journal of medicine.. 2019 Apr 18; 380(16):1584. "Sickle red blood cells are more susceptible to in vitro haemolysis when exposed to normal saline versus Plasma-Lyte A." Vox sanguinis.. 2019 Apr 2; Epub 2019 Apr 02. "Post-Transfusion Purpura Mimicking Idiopathic Thrombocytopenic Purpura: A Case Report." . 2019 Mar 27; Epub 2019 Mar 27. Author List: Blumberg N.; Heal JM. Author List: Blumberg, N.; Heal JM.